Weld-on replaceable blades and teeth are standard on the Excavator hydraulic Wood/Stump Shear/Ripper. Constructed of heavy duty, high strength, heat tempered steel, this machine can shear and split stumps, logs, poles, and roots for easy grinding and fast burning. It can also excavate stumps and reclaim ground surface with backblade, separate dirt, rocks and other debris and reduce wear on the recycler and promote clean, efficient burning. 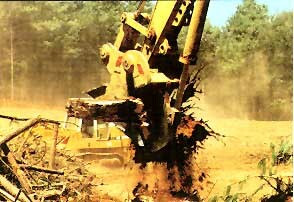 The unit opens wide for splitting lengthy stumps and other long material. Sizes are available to accommodate excavators from 45,000 to 110,000 lb.